When you think Lionel Messi, you typically think goals, dribbles, trophies, and the GOAT. However, this weekend, the world was witness to a slightly different sight of the Argentine international. 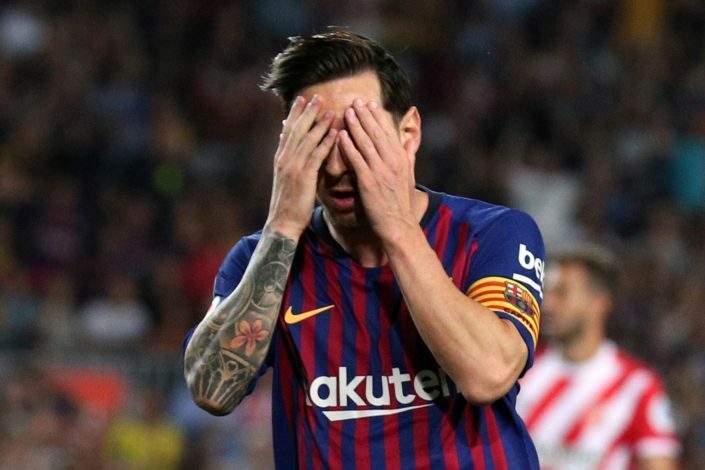 Messi’s Barcelona were in action against Girona, and seemed to be cruising to a regulation win in La Liga after he had given them the lead early on. The referee seemed to have other plans in mind, however, as before the half came to an end, he showed Clement Lenglet a straight red and gave Girona a one-man advantage. The player seemed to elbow an opponent and VAR confirmed the decision, giving Girona exactly the platform they needed to capitalize. Cristhian Stuani benefited the most from the decision, as his brace fired the away side into a shocking 2-1 lead only six minutes after the interval. Gerard Pique did find an equalizer in the 63rd minute to give his team a point, but that was not enough to prevent the Barca players feeling angry about the controversial call from technology. Lionel Messi led the protest post-match, as his anger was quite evident during his interaction with the match referee. Not only did the striker not shake hands with the officials, but he also had a few words to say before being pointed out of the pitch. This draw might prove to be a costly one in the long run, as Real Madrid have now caught up with Barcelona at the top, with only goal difference separating the two and giving Ernesto Valverde’s men the advantage.